Mike Benmosche, National Car Wash Program Specialist of McNeil and Company writes about how best safety practices at the wash can keep your employees and customers safe as well as help you maintain a cost effective insurance policy. As always, the cold season sneaks up on us quickly. Last year, one of our operators suffered a $151,000 loss as a result of their attempts to stay warm. 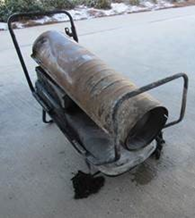 A portable heater was left too close to a combustible surface and it burst into flames. It was overnight so fortunately nobody was injured but as you can see below, the damage was significant. Something like this serves as a reminder that even the simplest things can escalate and get out of control fast. I recently had the opportunity to visit several car washes where I observed portable heaters ready to be placed throughout the tunnel. While I’m certain they will keep employees warm, will they be safely utilized? If your business doesn’t have company policies and procedures in place, I fear any safe use of this equipment will be based solely on luck. Not a comforting thought. Management needs to determine where and how to place these devices. Under no circumstances should they be used within 10 feet of any combustible materials. If an extension cord is necessary, be sure it conforms to the manufacturer's standards before use. If you choose this option, keep in mind the additional tripping hazard it would present. When considering using a fuel-based unit, use caution during refueling operations. Make sure fuel is stored in approved, properly labeled receptacles that are stored in cabinets specifically designed for flammable materials. Prior to any use, each heater must be inspected to ensure there is no damage, leaking fuel, or frayed cords. Never leave the unit unattended while running. Only portable heaters approved by management are acceptable. Be certain that all smoke detectors and carbon monoxide detectors are checked regularly. Remember to document this inspection each time it's completed. All portable fire extinguishers must be properly mounted and checked to ensure they are in working order. Be certain that all appropriate placards are visible as well. 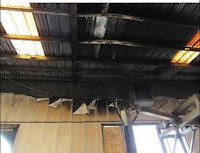 Employees should be properly trained on fire extinguisher operations. Once again, my personal thanks to Dave Snyder and Risk Management at McNeil for contributing these very important facts. They are able to assist with any help with designing a company policy for the safe use of portable heaters. Don’t put it off till something goes terribly wrong, start now! Remember a safe wash helps protect people and profits! Is Wind an Act of God? A strong gust of wind blows the front door open and strikes a customer, causing severe personal injuries. Is this the responsibility of Mother Nature or the owner of the car wash? The easy answer is to blame it on natural causes, but that might not be the RIGHT answer. At your car wash, the unexpected will happen and it’s nearly impossible to protect against every scenario that could occur. That being said, I believe there are several common hazards that require preventive attention and are too often overlooked. For example, everyone takes precautions to protect their wash when the forecast calls for tropical storms, tornados, or hurricanes that can cause severe property damage. But how many take the time to prepare with the same due diligence when it applies to more common weather forecasts, like heavy winds? Shouldn’t the additional exposure expected by this seemingly non-threatening event receive the same level of regard? Monitoring the forecast is already a daily task performed by most car wash owners to check for the probability of rain or severe weather. Consider implementing a process that steps up that practice. Include a checklist of potential risks that might pose a bodily injury threat in response to certain weather conditions, like high winds. Be sure that all doors are equipped with a permanent stop devices. These prevent the door from being caught by a heavy wind gust and swinging uncontrollably into unsuspecting customers or employees. Consider a second means of exiting the car wash as an option for when winds are extreme. Always the door that is more susceptible to being caught by sudden gusts. Double check tree branches and shrubbery for damaged or rotten pieces that may be dislodged by high winds. I’m sure that without much effort, you can think of several other ideas that aren’t listed above. Risk management all starts with the right mind set and accepting the unending challenge to establish a safe environment for employees and customers! Put on your thinking cap today and stay ahead of the next possible disaster. Remember a Safe Wash Protects People and Profits! !